Gravitational waves—the ghostly ripples in spacetime first predicted by Einstein and finally detected a century later by advanced observatories—have sparked a revolution in astrophysics, revealing the otherwise-hidden details of merging black holes and neutron stars. Now, scientists have used these waves to open another new window on the universe, providing new constraints on neutron stars' exact shapes. The result will aid researchers in their ongoing quest to understand the inner workings of these exotic objects. So far, 11 gravitational-wave events have been detected by the LIGO (Laser Interferometer Gravitational-Wave Observatory) interferometers in Washington and Louisiana and the Virgo gravitational-wave observatory in Italy. Of these events, 10 came from mergers of binary black holes, and one from the merger of two neutron stars. In all cases, the form of the waves matched the predictions of Einstein's theory of general relativity. 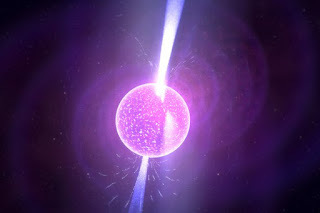 For the binary black hole events, the passing waves lasted less than a second; for the merging neutron stars, the emissions occurred for about 100 seconds. But such rapid pulses aren't the only types of gravitational waves that could be streaming through the universe. In particular, solitary neutron stars might be emitting detectable gravitational waves as they spin—signals that could reveal important new details of the stars' topography and internal composition.